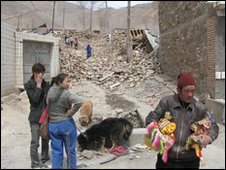 The powerful earthquake which struck Yushu in China's Qinghai province has left tens of thousands of people homeless. Arnold King, an American teaching English there, describes the situation for local people. We've had a tough week. Everyone is feeling stressed out. Things are better now compared to the first couple of days after the quake. There are several NGOs distributing food. Lack of food is not a problem anymore. The problem is with shelter, tents, blankets and warm clothing. It's very cold here at night. We also need medical care. There are lots of injuries that need to be treated. I still don't have news about many people. There are so many camps all over town, people are scattered all over the place and it's impossible to find the ones you know. We made a little team - foreigners, some NGO people and some people from our camp and we try to do many different things, like food distribution or trying to reunite people. Nobody has a specific job, we just do whatever needs to be done. Right now I am now on my bicycle heading towards the hills to bring food to people there. There are people up in the hills who refuse to leave their destroyed houses, because they are afraid that looters will go through the rubble to steal their things. That's why they stay up there. It's most difficult to get aid to them. The earthquake struck early in the morning. I was in bed and had to run out in my underwear. I couldn't immediately see any damage. Our area was a little bit better than the west part of the town. There was lots of dust. When the dust settled, it became obvious how much damage there was. Especially up in the hills all the mud houses have collapsed. 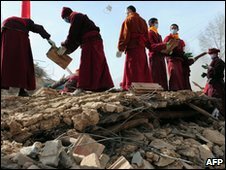 That school where I was about to start teaching was completely destroyed. Fortunately, there was nobody inside at that time. I ran to my students in the nearby school to make sure they were ok. People were standing outside, they were distressed and some were crying. We hugged each other. We spend the next couple of days digging and trying to rescue trapped people. I wouldn't call it a rescue operation, because they were not coming out alive. Those were my first dead bodies - it was a numbing experience. Because some of my students died, when I see someone, it feels great. This morning I was very down and then one of my students just walked into my camp - it was such a great feeling. It was very frustrating in the beginning. I didn't see much help from the government. They would come with their cameras, film some people being rescued alive and once they got their pictures, they would move away from a building, where there could be more trapped people. Monks have been doing lots of the digging. Now we are being told that we are not allowed to give out food. I am supposed to be gone from here. I was having my visa renewed when the earthquake happened. So when I went to collect my passport, the official told me to leave. Why? Good question. I am assuming they don't want Westerners here. I will probably be gone in a few days. There was a protest at the camps a few days ago about lack of food and although things are better now, there's got to be a constant influx of food supplies. People are worried that they'll run out of food and some have started to secretly store food in their tents. I can't put a number on the people who became homeless, but there are scores of camps and the biggest one is on the horse-racing festival ground. It's huge. 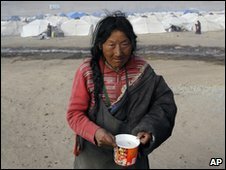 Yushu has become a slum city. People here know that this will be their home for months to come. Some are keeping high spirits, but others are desperate. Everyone is worried about the future.